"Space: The Final Frontier. Above us, around us, within us. We have always looked to the stars to discover who we are." 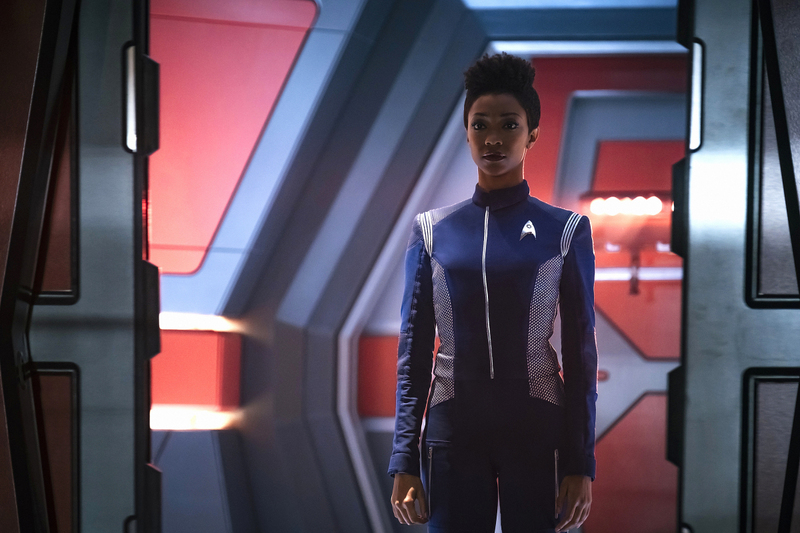 By nature I love brevity: Star Trek: Discovery takes a long, clean breath of fresh air in this big, bold premiere that sheds the burdens of Season One and lets them roll down the hill behind. Star Trek: Enterprise was canceled in 2005. And in the Fall of that year, as shows premiered, fans were faced with a sad reality: for the first time in 28 years, a new season of Star Trek was not among them. And for 12 years, this continued. And then we Discovered a new frontier. Breaking the silence of more than a decade, Star Trek: Discovery was a sign that Trek was not dead. But of course, it was not without its flaws. Discovery Season One had issues with its tone and its dialogue. The crew, above and beyond their stilted, grandiose speech, rarely seemed like a family, or even a group of people who like each other. And the levels of anxiety and brooding were at dangerously high levels. We're talking Superman from Batman v. Superman levels of anxiety and brooding. The fans pointed out these issues, though the good parts still remained (excepting the 'fans' who actively went out of their way to be openly hostile towards the series, its creators, and its viewers). And the team behind Discovery listened. 'Brother' benefits from a light and relaxed tone that feels like the lifting of a heavy curtain. The crew speaks in a generally human and natural manner, and they work together like a tight family. Brooding is nowhere to be seen, and the anxiety present is of a different sort than the cloud of deep worry that permeated Season One. Instead the viewer felt more of an empathetic concern about the characters and their lives. The first and most immediate effect of 'Brother' is, in fact, to distance the show from its past mistakes. Associating these issues with the influence of Captain Lorca makes a lot of sense from a story perspective, even if the creators' insistence that all the darker elements were only a result of him doesn't quite sit right. From the outset, Captain Pike makes it clear that he is very different from Lorca. Everything about his manner and bearing suggests a completely different man from Jason Isaacs' power-hungry warmonger. But Pike is no Kirk, either, as one might anticipate. Anson Mount gives his Pike a humility and a grounded feel that Kirk never quite developed. The other proverbial elephant on the starship is the presence of Spock. Though the adult version of our beloved half-Vulcan does not appear, his importance in the events of 'Brother' and the impact the mere allusion to the character has on the series is clear. We learn that he and Burnham's strained relationship is the result of her decisions, not his. It's clear she views him and his legacy as an oppressive force in her life, perhaps as a standard she could never live up to? There's a great shot that really sums this up, when young Spock makes his holo-dragon. The dragon moves toward Burnham, and roars at her, and Spock walks in through its mouth. I think that's how she sees Spock. Sarek and Burnham's conversation about reverence also factors in. This show has decided to include a character that most fans undoubtedly have a lot of reverence for. But to make him a useful character, with an arc and a purpose, reverence is not enough. The massive weight of Spock's impact on Star Trek and the fans' adoration of him will be a problem that Discovery will have to deal with. Moving to our regular cast, I loved how they were dealt with here. The other side of Lorca's effect on the Disco crew is that such a major and personal adversary has brought them together and made them rely on each other. All of the returning cast felt like a family around each other, and their interactions made the ship feel like a real workplace run by a real team. This is a major improvement from last season. It looks like Burnham's journey this season will be thoroughly intertwined with Spock's. I look forward to seeing her relationship with him and how it develops, but I do hope they give her a role to play apart from and outside of the shadow of her foster brother. Likewise, Stamets seems overshadowed by the impact of someone else. Everything around him reminds him of his lost love Dr. Culber, and he's having a very hard time dealing with it. It seems like the end of this episode was enough to get him at least a little bit excited about science again, though it's unlikely that this is the end of his plotline about leaving the ship. With Wilson Cruz brought on as a full cast member for this season, it'll be interesting to see where this goes. Tilly and Saru don't seem to have much in the way of an arc yet, but I'm sure this will change. I expect most of Tilly's story this season will have something to do with her enrollment in the Command Training Program. Saru mentioned his sister Siranna, from the Short Trek 'The Brightest Star,' and the showrunners have stated that we may see other Kelpians this season, so expect to see a visit to Saru's home planet of Kaminar sometime in the future. Maybe siblings will continue to be a theme this season. Overall, 'Brother' was a pretty epic way to kick off the new season. It's fun and engaging, with a lot of potential. I can't wait to see where we go from here. This section will record the planets the Disco visits and the places they go. Not a whole lot of that in this particular episode. Here I'll keep track of all the new species, ideas, and cultures the crew encounters. Again, nothing in the way of that here. -Mia Kirshner (Amanda) looks a lot like Amy Adams. She also really resembles Amanda from TOS, so that's nice. -Stamets has a botanist friend aboard the Enterprise. -In keeping with the Trek tradition of altering the intro, we have some brand new graphics added to the opening theme. -Regulation 19, Section C allows a higher-ranking officer to take command of a starship in one of three contingencies: 1. An imminent threat; 2. The lives of Federation citizens are in danger; 3. There is no more qualified officer available to deal with the situation. -I love Doug Jones' Saru walk. It's just so much fun to watch. -That's the first shot we've gotten of a turbo lift running through a starship in all of Trek, if memory serves. Pretty cool, too. -Another Alice in Wonderland nod. Also, holo-candles. -Sarek mentioned that he's reached out to Klingon High Chancellor L'Rell (Mary Chieffo), and she had no explanation for the red bursts either. -The Captain goes on the away mission, in true Trek tradition. -There was a bit of Spock's Jellyfish ship from Star Trek (2009) in the design of the pods they flew. -How cool was the pod sequence? Also, it was admittedly rather satisfying to see Olson Connelly get his comeuppance when he failed to pull his chute crashed and died because of the dumb risk he took. -One of the ads loaded at the wrong time when I watched this the first time. The long ad break split a shot in half. -I liked Reno (Tig Notaro). The idea of using an engineering approach to medicine is interesting, although I wouldn't want to be one of the first patients it was tried on. -The Red Angel is still very much an unknown. I partially expect it will have something to do with the Klingons, if not only because they seem from the trailers to have a big role to play. -The asteroid material wouldn't beam up. That's intriguing. It may be the key to fixing the spore drive, too, as it looks from the trailer that we'll be jumping again this season. -'Not every cage is a prison, nor every loss eternal.' That's very interesting, and it has a lot of significance for Pike. -It makes sense that the crew of the Enterprise would have issues with sitting out the war while on their five-year mission. -The Disco's new Doctor is named Dr. Pollard. -A lot of references to faith/religion and related subjects in this episode. I don't think it's necessarily significant, but I thought it was worth noting. -Alex Kurtzman directed this episode. I thought he did a great job; maybe he should stick to that instead of the whole coming up with ideas thing. I'm still baffled by the seriously weird and unsettling bits about Klingon anatomy from Season One. Amanda: "I bless you, Michael... all my life." Pike: "Do not covet thy neighbor's starship, Commander." Pike: "Why didn't we think of that, Connelly? Think of all the syllables that gave their lives." Pike: "Sometimes it's wise to keep your expectations low, Commander. That way we're never disappointed." Advice to the audience, perhaps? Tilly: "I put her in a Utility closet, and I put you in there. I'm drunk on power." Stamets: "Tilly, you are... incandescent. You're going to become a magnificent Captain because you do everything out of love. But I need you to repeat after me. I will say..."
Sarek: "Spock has great reverence for his mother, but reverence tends to-"
Burnham: "Fill up the room." It's the shot of Burnham's fairly empty quarters just as she interrupts that sells this one. Pike: "Detmer - fly... good." Pike: "I was expecting a red thing. Where's my damn red thing?" Pike: "Spock asked the most amazing questions. It's completely logical, yet somehow able to make everyone see that logic was the beginning of the picture and not the end." Burnham: "There are so many things I wish I'd said to you; so many things I want to say now. I'm too late, aren't I? I can only pray I don't lose you again... brother." A strong, solid premiere. 5 out of 6 damn red things. CoramDeo is interested in things. "Alex Kurtzman directed this episode. I thought he did a great job; maybe he should stick to that instead of the whole coming up with ideas thing"
Here, here!. The less he writes, the better. Really enjoyed this episode, especially Anson Mount as Pike. I wasn't that big a fan of Season 1, I think because the character of Michael Burnham made a REALLY bad first impression with me, as did this new take on the Klingons. In those first couple of episodes T'kuvma sounded like he had rocks in his mouth when he talked, and I'm really not a fan of their visual design in this series. I do think Season 1 improved as it went on, though I wasn't thrilled to see the Enterprise show up. It felt like a cheap ploy. But I heard about Anson Mount being cast as Pike and I got intrigued, I usually like him whenever he shows up in something I'm watching. And after watching this episode, I have much higher hopes for Season 2. Not only was Mount great as Pike, but I was glad to see some of the lesser-used characters get a chance to do more than just repeat the commands given to them on the bridge. And it's great to see Tilly growing in confidence, the "adorkable bumbling greenhorn" act wears thin if it doesn't evolve. This new mystery of the red energy bursts is intriguing, along with the "Red Angel" vision that Burnham had. Star Trek's ventures into the metaphysical/spiritual realm can be hit or miss. But when they do it right, like they did on Deep Space Nine more often than not, it can make for excellent storytelling. I'm definitely curious to see where the story goes this year. I really liked the new, lighter tone for the series and the greater sense of the crew as a family. But I couldn't believe it when Stamets talked APPROVINGLY about how a Kasseelian opera singer kills herself after her first performance and said how much Dr. Culber liked this. A Starfleet physician approves of someone’s killing herself for no good reason? I was trying to imagine Dr. McCoy’s attitude towards Kasseelian opera singers and thought he wouldn’t have found it gorgeously romantic for the diva to kill herself; he’d have thought it was a sad waste of a person’s life and of all that training. What is this version of Starfleet, that their officers — including a PHYSICIAN — could approve of such a thing?! It feels as if the writers have memorized a lot of Star Trek facts without having truly grasped the HEART. Finally subscribed and saw this premiere and am mad at myself for putting it off a few weeks because I loved it. CoramDeo, you and the previous commenters already said pretty much everything I would say, but I loved the feel of this premiere, enjoyed Pike and Reno in particular, thought the pod sequence was terrific. I'm hoping for a season with minimal Klingon presence, and I'm okay with a new Spock in my life. Here's hoping they do the character justice.